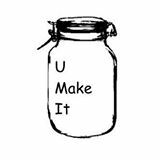 U Make it - Get Involved. Make Friends. Enjoy Motherhood. U Make It is a one stop shop when it comes to crafting! We have all of our tools on site to make sure whatever craft you want to create isn’t just a dream! We work with you every step of the way so you r project is uniquely made by you. No experience necessary. ALL LEVELS WELCOME. Who doesn’t love a good cup of coffee or tea while you work? We have those needs covered as well!